This app is similar to the stats editor that is included with AMX-X but it includes more features. Note: A backup of your stats file is created the first time the app loads. Included in the zip is the required VB6 runtime dll. - Fixed overflow error. Was accidentally using an int instead of long to hold body-hit values so when the value exceeded 32767 it would error. I take it this was written in VB6? Microsoft Word has encountered an error. As a result of this your bank account has been emptied, your credit cards maxed out & your family has been brutally murdered. Thank-you for using Microsoft Products. how to put in this with ftp and edit it ? 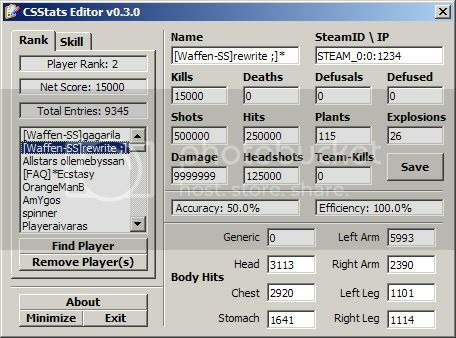 Just dl the csstats.dat and use this to edit it, then re-upload it. I just realized I havnt done this using an ftp server yet, but it makes sense.